<< Back Stunning Moonstone Heart Necklace - On Solid Silver Chain - NEW AND ELEGANT! Stunning Moonstone Heart Necklace - On Solid Silver Chain - NEW AND ELEGANT! 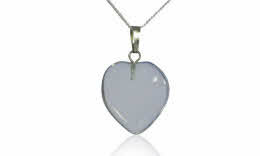 It is crafted from a gorgeous little polished Moonstone Heart pendant strung from an 18 inch solid silver curb chain. Moonstone is not often seen but is a lovely crystal. While hard to capture in a photograph it has a lovely translucent shimmer when light falls on it.